It's hard to imagine a less likely crossbreed canine than the Chihuahua and heeler -- the later more appropriately known as the Australian cattle dog. The Chihuahua is the smallest of all purebred dogs, while the Australian cattle dog is an extremely high energy, working breed. To paraphrase Forrest Gump, with this mix, "You never know what you're going to get." The blue heeler was bred to work cattle all day. That's not a job for a Chihuahua. 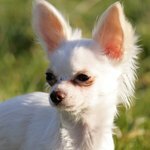 The Chihuahua breed standard doesn't specify a height, but the weight limit is a mere 6 pounds. Chis usually stand about 5 inches high at the shoulder at maturity. Male blue heelers stand between 18 to 20 inches tall at the shoulder when full-grown, with females slightly smaller at 17 to 19 inches. Australian cattle dogs weigh between 44 and 62 pounds. That makes an Australian cattle dog at least three times the size of the Chihuahua, and more than eight times the maximum Chi weight. Expect a Chi-heeler mix to wind up smaller than the average Australian cattle dog, but far larger than the Chihuahua parent. A Chihuahua's coat is either shorthaired or longhaired, while a heeler's coat sports a double coat with a dense undercoat. An Australian cattle dog is either red or blue -- the red heeler and the blue heeler. A Chihuahua can appear in any color, with large amounts of white permitted. Thus, the Chi-heeler mix's coat might appear in various lengths and shades. The Chi has an "apple" skull with erect ears. The heeler's head is broad and strong, with pricked ears. The Chi carries his somewhat long tail up, or looped above his back without actually touching it. The heeler's tail is set relatively low, hanging at rest "at a slight curve," according to the breed standard. A Chi often behaves like a big dog in a little dog's body, acting much tougher than he has any business doing. Putting that Chi temperament in the actual body of a bigger dog could cause trouble, especially since the heeler can be a pretty tough customer. Heelers aren't recommended for inexperienced dog owners, as they are fairly challenging canines. Chihuahuas are alert, self-confident and independent. Mix the two together, and you may end up with a formidable pooch. A Chihuahua's exercise needs are minimal. A heeler's exercise needs are maximal. With luck, your mix falls into a happy medium, so that moderate daily exercise suffices. These two dissimilar breeds have one thing in common. Both make good watchdogs. Heelers are basically healthy dogs, with relatively few genetic issues. 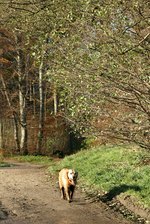 Deafness occurs in the breed, as does progressive retinal atrophy, which eventually renders a dog blind. Some heelers are born with hip dysplasia, a deformity which can require surgical correction. Many Chi health issues result from their diminutive size, so they might not affect a larger crossbreed. Chihuahuas often suffer from patellar luxation, a condition common in small breeds. However, when crossed with a dog as large as the heeler, those "slipped kneecaps" might not occur. Tracheal collapse, an toy dog problem, is less likely to affect a mid-sized mixed breed. The Chi's life span can reach into his late teens, while a heeler usually lives between 12 and 14 years.